"NOVICE" is switch operated only. Hides 1 number plate only. No LED indicator light to remind you when the plate is hidden. And does not includes a cigarette lighter plug for easy power supply (must be hard wired to battery too). Curtain cover motorized hide gadget is super durable and weather resistant. Gadget uses a very powerful full metal neodymium permanent magnet motor and metal transmission gears. Powered by electricity, to hide or show a license plate you use a switch or a wireless remote control*. A-CHOICE "NOVICE": Novice curtain-cover gadget comes with 1 hide plate bracket so you can ONLY hide 1 license plate. It is up to you if you hide front or rear license plate. 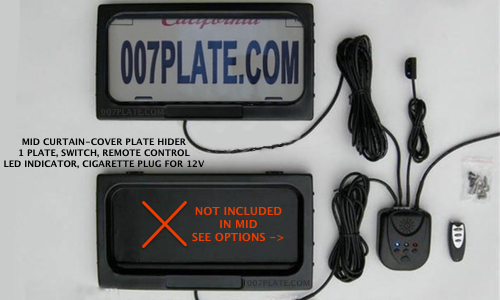 Comes with 1 switch which you install inside your vehicle so you can operate the license plate hider. NOT INCLUDED: You can not hide both front and rear license plate like "PRO". Does not come with a remote control so you can not hide the plate from up to 150ft away like (MID upgrade C) & (PRO upgrade D). Does not come with a LED light which lights up anytime your plate is in HIDE position. Very useful so you don't forget that your plate is hidden while driving. And does not come with a cigarette lighter plug for easy 12v power like "MID" and "PRO". This kit must be hard wired straight to battery. 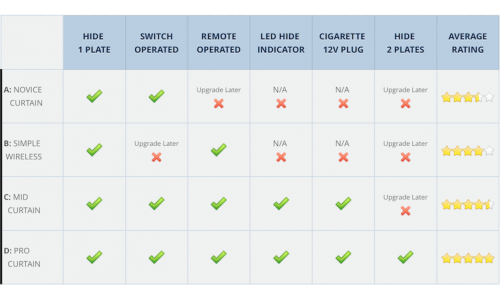 B-UPGRADE "SIMPLE Wireless": this option changes the NOVICE gadget from switch operated to remote control operated. Easier installation (less wiring). 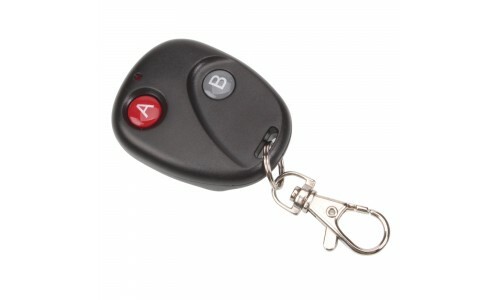 Does not come with a switch operation, it becomes only remote control operated. C-UPGRADE "MID": Mid curtain-cover has 1 hide plate bracket, switch operation, remote control, LED position indicator never forget when your plate his hiding, cigarette plug for easy 12v power. Only missing the ability to hide 2 (both front & rear) license plates. See PRO. I like that the installation only took about 15 20 mins. I purchased the B: simple wireless. Basically all it is is you use 2 screws to hold the gadget and the plate onto the back of the car and then u just run one wire from gadget into the trunk and connect the positive wire to license plate light for power and black ground wire anywhere to the chassis. Pretty easy. Only reason I'll give it 4 stars is i wish the gadget wasn't as thick as it is, is about 3/4 inch thick probably to make room for the curtain to go up somewhere?